I'm not so sure that Trump the birther, racial bigot, ban all Muslims, and build a wall is in his favor with the majority. Most don't even know how much the wall at the border will actually cost. Mexico already said they're not paying for the wall. Is Trump ready to go to war with Mexico because they refuse to pay for his ridiculous wall? I doubt Trump actually cares. I think he in this for the business deals with his foundation. There is the debates yet to be televised, if tRump has the balls to actually lie on television and have Hillary call him on them. It's a year filled with reversals and uncertainty and anything could still happen. However, I have a growing perception of a fairly widespread public thirst for something different from what we have experienced over the last eight years. That and the decline in trust for Clinton might well be decisive. It's a lot less dogmatic than most of your somewhat bombastic posts. tRump even lied when he admitted the birther lie was bullshyt, and used the tv time to tell more lies while he promoted his new hotel. And people think the sob has their interests in mind. I think its time to check the schools to find why people no longer recognize a blast of lying bullshyt when they hear it. The chart strongly suggests that there is a group of 5% of the voters who love to tell pollsters that they are for Trump, until Trump gets even in the polls. Then they realize that Trump is unthinkable, and they flip back to Hillary when it looks like Trump has caught her. Trump's recent rise might not be as beneficial to Trump's chances as his proponents like to think-a certain percentage of his supporters will flip to Hillary when the election is on the line. Interesting graph, but I wonder if those trends can be projected to election time and date. Well, no elections were held during the one year the graph shows. The only election will be in November. As for any gurarantees that one candidate or the other won't just run away with it from here on, I can't say they won't. But every time it looks like Trump's surge is going to pass Hillary and leave her in the dust, Trump's surge suddenly stops and Hillary takes a big lead again. Either Hillary has managed to find come compelling issue each time she falls back to a tie, or some people are telling the pollsters they want Trump because they figure he's not going to win and so they neatly avoid the issue of whether Trump can run the country. Then when Trump looks he might win, these voters freak out and tell the pollsters they're for Hillary, however reluctantly. There are lots of facts supporting my many opinions. Our discussion on these two threads seem to be converging. My assertion is that you are ignoring any facts that contradict your political bias. Gosh ! With insights like this to the thoughts of potential voters everywhere Blickers doesn't even need polls. So what does the graph of Hillary vs Trump for the past year suggest to you, George? What I see is Hillary holding onto a significant-to-large lead for the past year, with Trump making four sudden surges until he pulls even, then just as suddenly drops back. 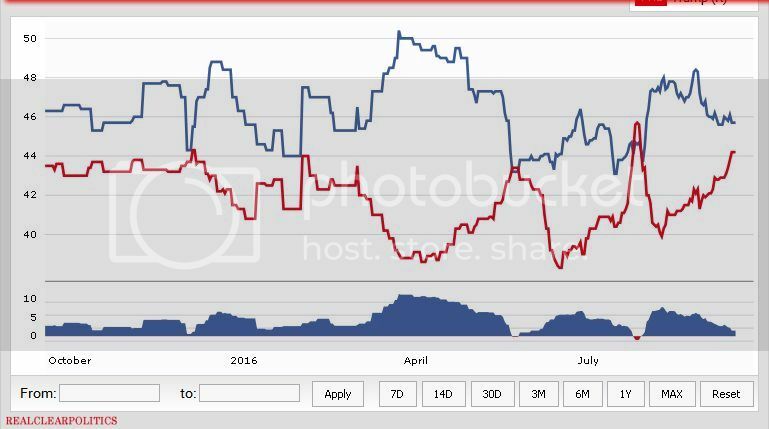 Trump hasn't had a sustained lead all year. Hillary's been up there between 43 and 52% while Trump has been 44 down to below 20%. I don't see how Trump can win when he was above Hillary only once for a very short period. I'd put my money on Hillary. It does look like Trump is mostly behind, but every few months makes a run at Hillary before falling back. We'll see if that trend continues. Blickers is right though. A year filled with reversals and uncertainty, in which anything could still happen? Sure, there's been an ample share of outrages du jour, which the media have duly played up because that's how they get eyeballs. 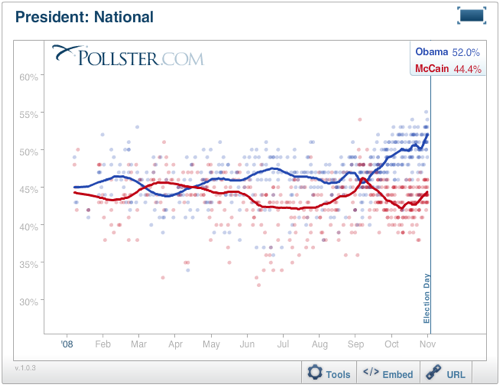 But the polls have been showing a pretty straightforward race. Yes, there's been ups and downs. But Hillary's consistently polling 44-49%, and Trump's consistently polling 39-44%. A particularly tight or suspenseful race that does not make. Even both of Obama's races saw times of greater Republican fortunes than this one's demonstrated so far. I suppose anything could always still happen, but Blickers is right to point out that the polls don't provide much backup for your wishes. Note the axis labels. Romney was within 2% for much of the race; Trump has only rarely come that close, especially once the primaries were done. » Are We Ready For a Woman President? Really?